Hundreds of demonstrators gathered in Houston on Sunday for a pre-Super Bowl demonstration against US President Donald Trump. 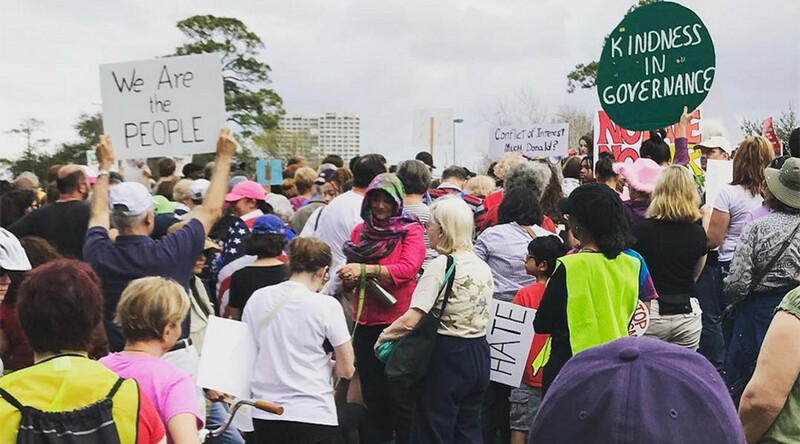 The protests kicked off in Houston’s Hermann Park at midday, more than five hours before the New England Patriots and Atlanta Falcons faced off at the city’s NRG Stadium for Super Bowl LI. Approximately 500 people carrying anti-Trump signs and chanting, “Hey, hey, ho, ho, Donald Trump has got to go!” attended the march which traveled a two-mile route from the park to the stadium. Local TV station KHOU reported that activists from Black Lives Matter, the local Democratic Party, the American Civil Liberties Union (ACLU) and the Communist Party were all involved in the demonstration. Placards criticizing Patriots’ star quarterback Tom Brady and head coach Bill Belichick, who have expressed support for Trump in the past, were evident amongst the crowd. #HoustonResists is a peaceful protest that's utilizing the national spotlight on our diverse city to talk about inequality. There were also numerous signs condemning Trump’s “Muslim ban,” the executive order which prohibited people from seven majority Muslim countries from traveling to the US, and his plan to build a wall along the border with Mexico. Signs supporting the protests against the Dakota Access Pipeline were also on display.